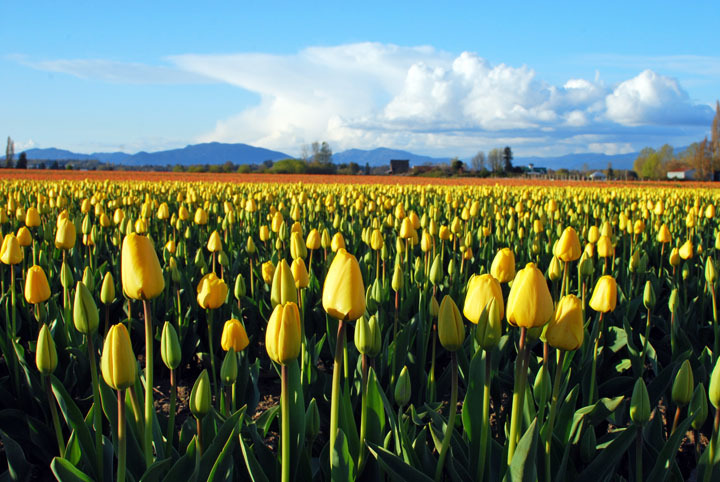 April brings us the Skagit Valley Tulip Festival. I photographed these beautiful Golden Apeldoorn tulips just around the corner from Dunbar Gardens. 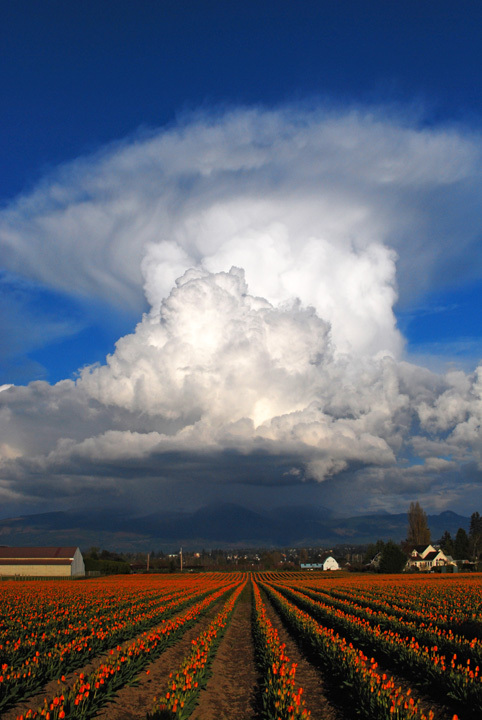 This field is located next to McLean Road and has been designated Field 26 on the Roozengaarde “bloom map“. Washington Bulb Company is the largest bulb grower in the US and these tulips are part of their farm production. They have this bloom map on their website that you can check to see the locations of the fields, whether they are in bloom, and which bulb varieties are growing there. This lovely field has Golden Apeldoorn and Elite tulips just beginning to bloom, so it should be a traffic stopper the next couple of weeks. The tulip fields have packed soil roads that are used by the farm equipment and workers. As long as you stay on these wide paths you can go into the fields and take a few photos. I like to ride the bike down the road and into the field with my camera. 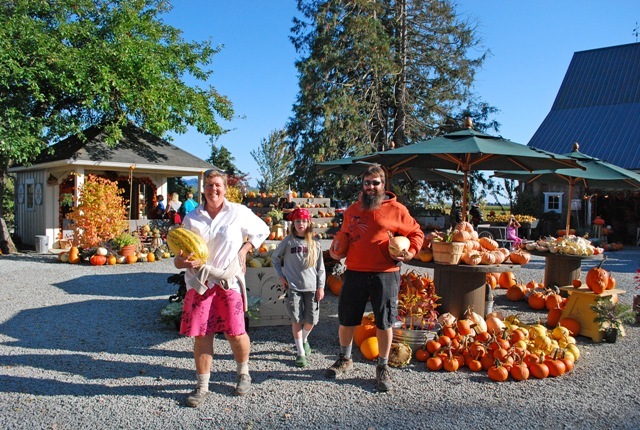 There is a local business Tulip Country Bike Tours that offers bike tours of the flower fields, display gardens, and refreshments and is customized to the weather and field bloom as well as the preference of the group. They usually ride past Dunbar Gardens on their way back to the home base. It’s enjoyable to meet the variety of people from many places who stop in on one of the bike tours. The smiles on their faces are recommendation enough for taking a bike tour instead of hassling with a car on our country roads. 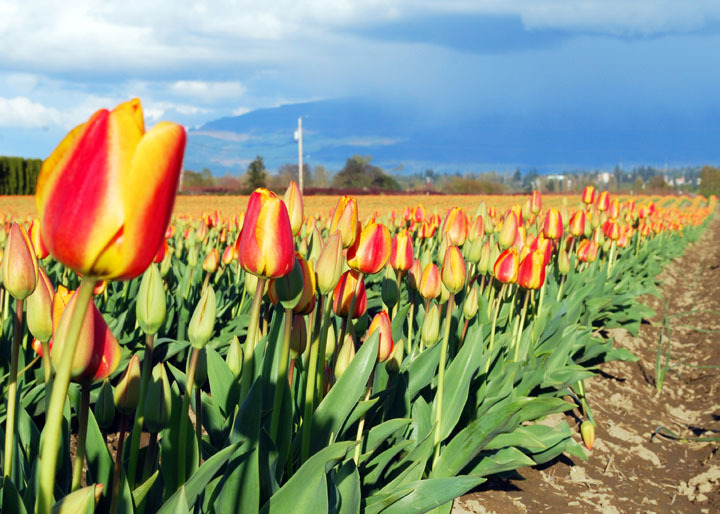 Hopefully when you visit the Skagit Valley Tulip Festival you might run across one of our signs pointing the way to another roadside attraction! 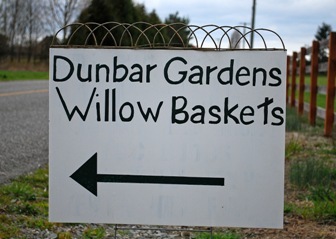 We don’t offer any frills or thrills, but we have this nice selection of willow baskets to check out. Our small farm is admittedly pretty rustic, and I think many visitors that wander down our driveway are surprised at the quality of the willow baskets that they find in our barn. 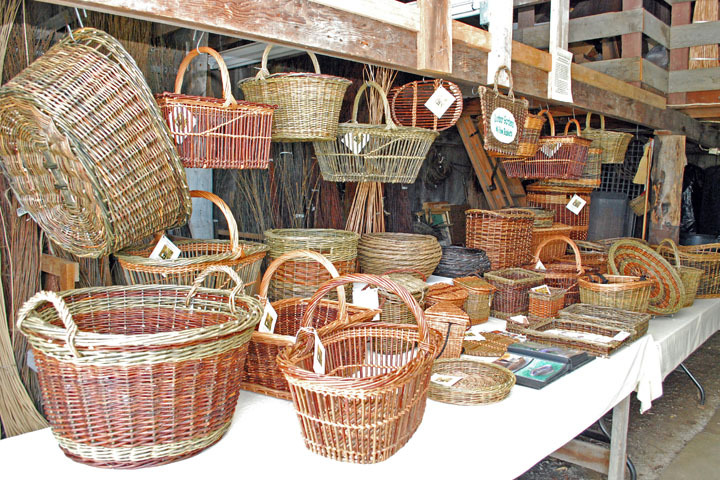 There are few willow basketmakers around let alone one as accomplished as Katherine Lewis. 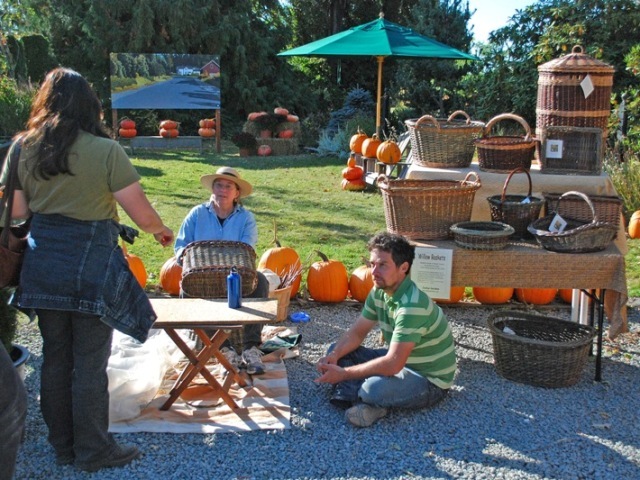 It is enjoyable to explain how we grow the basketry willows, and show folks the freshly harvested bundles. Of course, our baskets are available any time of year. We don’t mind if the tulips are the headline act for Spring visitors to our beautiful valley. 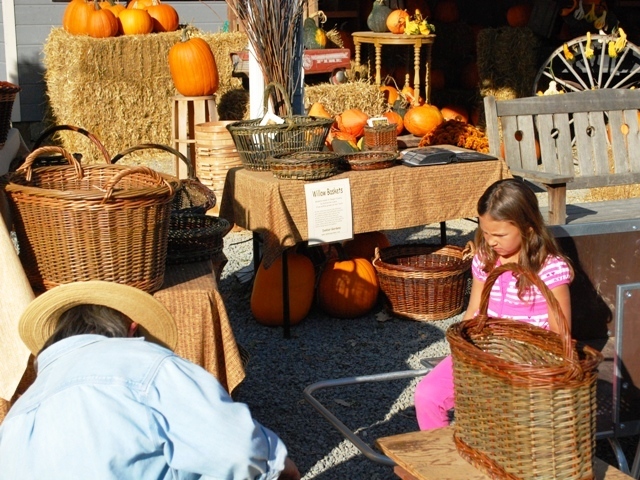 We figure they will be back to get a taste of the wonderful fruits and vegetables also grown in the valley, take in the Festival of Family Farms in October, or maybe a visit to nearby La Conner to take in the Museum of Northwest Art and eat at our favorite Skagit restaurant Nell Thorn. Stop by, we’re around! Katherine has been working on her version of a basket to attach to the front handle bars. She decided an oval shape would work best for a variety of handles and front cables. She has woven it with four slots to give some flexibility on how it is attached. It comes equipped with two adjustable straps with quick release buckles which makes it convenient to remove from the bike. 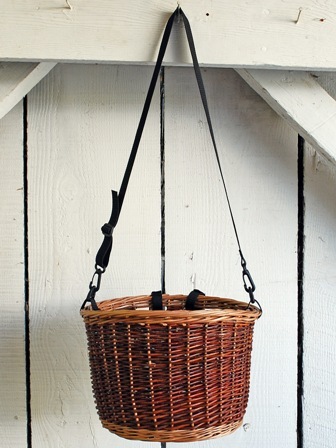 She also put two side loops on the basket for attaching an adjustable shoulder strap. 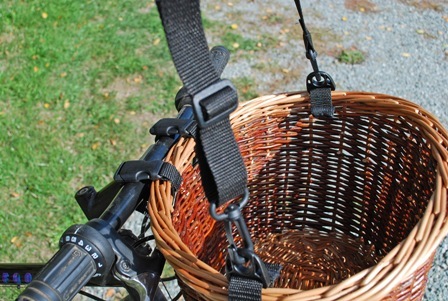 You can remove the basket from the bike and conveniently carry it with you into a store or library, for example. The base, stakes, and border are made from peeled ‘buff’ willow which makes it fairly light weight. 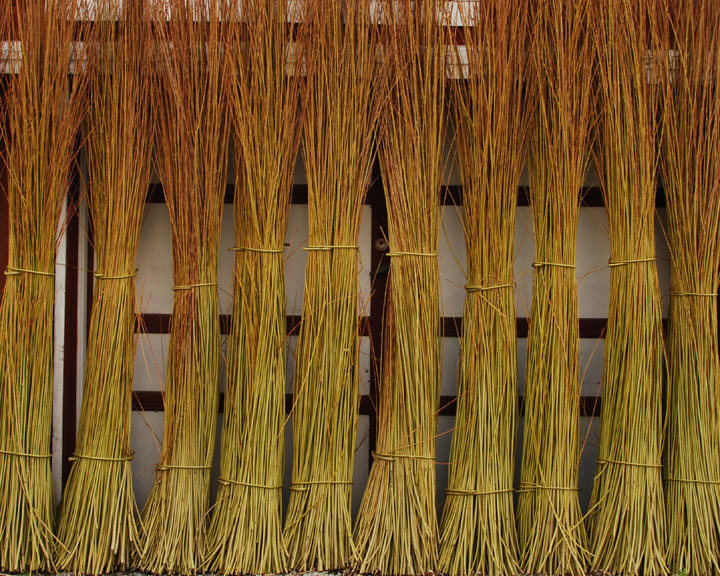 The side can be woven from one of the attractive colors of willow we grow; in this case a nice red. 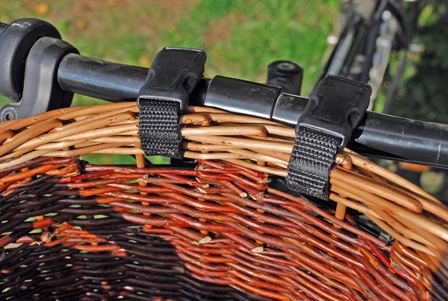 When shopping for a bike basket, pay close attention to the number of stakes in the basket, and how the border is attached. 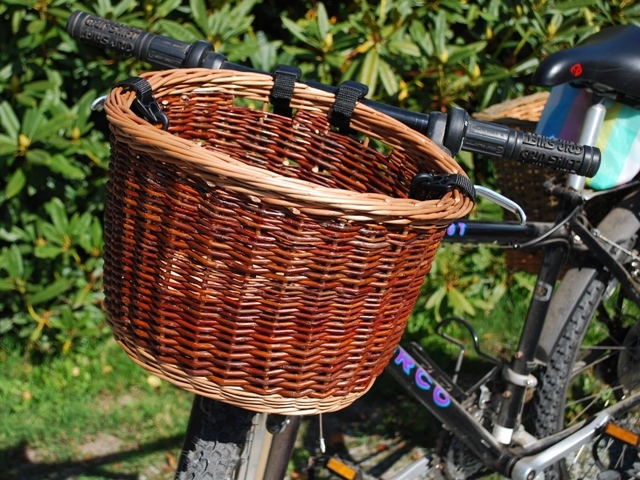 There are a lot of cheaply made wicker baskets being sold for bicycles. Better to buy a well made willow basket that can be a friend for life. Katherine recently won the Grand Champion ribbon in the professional basket maker division of the home arts competitions at the Puyallup Fair, or officially the Western Washington Fair. She won the blue ribbon in the wickerwork category and the overall winner. 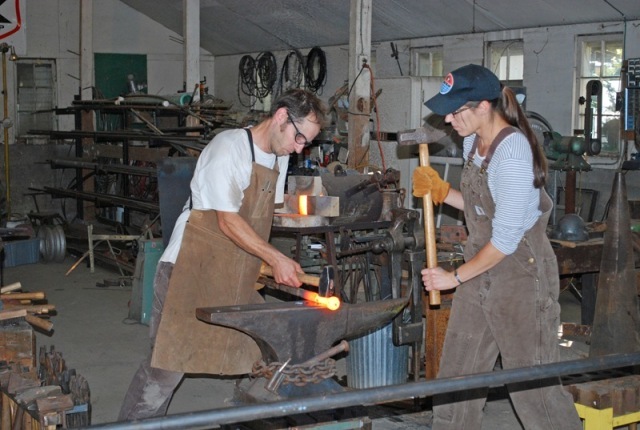 This year the fair ran from September 11-27 and had well over a million visitors. 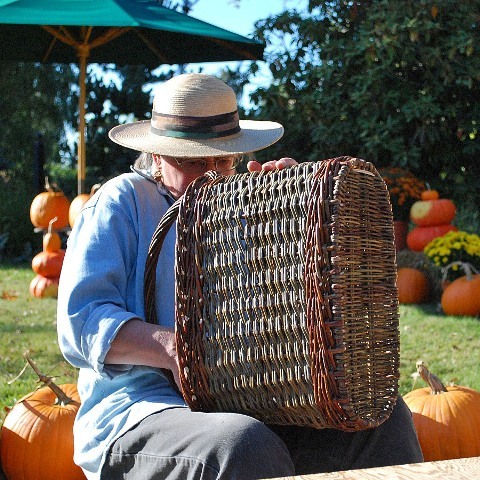 In recent years, entries in the basketry categories had been dropping; so members of the Northwest Basket Weavers Guild made an effort to encourage participation this year. Katherine was fortunate to have Vicky Nickelson transport her basket to and from the fair. 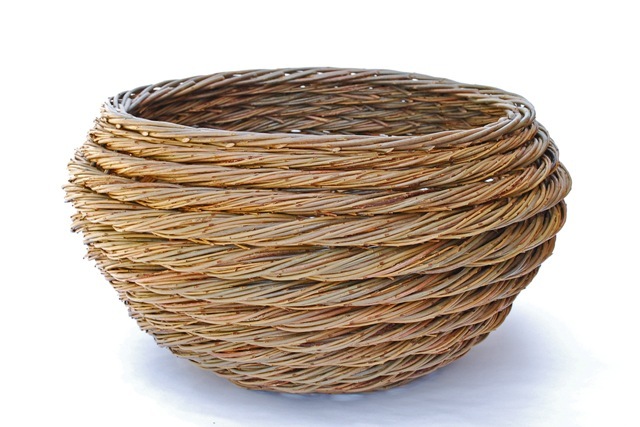 In case weavers are interested, the basket was made from Salix purpurea ‘nana’.